The Swedish theologian and historian Johann Erich Thunmann (1746-1778) was born in Thoresund (Södermanland, Sweden) and studied in Uppsala (Sweden) and Greifswald (Germany). 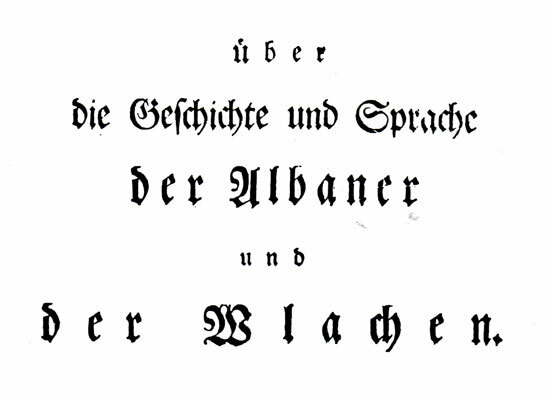 In 1772, he was appointed Professor of Rhetoric and Philosophy at the University of Halle (Germany), where he wrote his treatise “Über die Geschichte und Sprache der Albaner und der Wlachen” (On the History and Language of the Albanians and Vlachs), Leipzig 1774. This is one of the earliest scholarly studies on the Albanians, who were little known in Europe at the time. After a short introduction, Thunmann reproduces the Latin-Vlach-Albanian dictionary of Theodor Kavalliotis of Voskopoja (Moschopolis) with some notes on the Albanian and Vlach (Aromanian) languages, and then offers a history of the Albanians that is surprisingly detailed for the period. The section on Albanian history is given here in full, though without the footnotes. Modern place names have been added in square brackets for the translation. I would now like to turn to the actual history of the Albanians and of the country they inhabit. They are the descendents of the ancient Illyrians, whereas their neighbours, the Vlachs, whose ancient history I will deal with later, are the children of the Thracians. I will try to prove these statements as best I can. The people that live between the Ionian Sea and Macedonia, between Chernagora [Montenegro] and Neo-Castro on the Evenus [Evinos] and that speak Albanian did not always have the name Albanian. They were once a tiny group inhabiting the region in Macedonian Illyria between the Drino [Drin] and the Siomini [Seman]. Ptolemy is the only ancient writer who refers to them and their capital Albanopolis. They lived in mountainous terrain, maintaining themselves and their name despite all the revolutions which swept through neighbouring peoples. They remained within these narrow confines since the latter are mentioned centuries later by Byzantine writers and in the correspondence of the Popes. In the year 1250, the regions of Pulat [Pult] and Chounavia were not included in the territory called Albania. But soon thereafter, the term spread to be used for them and other northern districts. Kroja [Kruja] was already referred to as an Albanian town in the year 1254. In 1273, Albania stretched to Durazzo [Durrës], in 1340 to Kanina and Beligrad [Berat], and from 1340 through Acarnania down to the Achelous. In 1357, John Cantacuzene wrote that the Albanians were neighbours of Thessaly and inhabited that mountainous area in 1332. After this time, they spread and spread and conquered Aetolia, Acarnania, Thessaly and a large part of Macedonia and the Peleponnese, including several islands both in the Aegean and in the Ionian. Chalcocondylas may have been badly informed, but he at least knew that the homeland of this people was the region around Durrës. Even nowadays, Albania proper is referred to as the part of this territory lying to the north of this town. But the people themselves did not use this name and did not identify with it. The Greeks, who were the first to come into contact with the actual Albanians as an independent, warlike people devoted to herding, used their name to refer in general to the inhabitants of the mountainous areas of Greek Illyria and Epirus who used the same language and had the same customs as the Albanians and with them flooded down onto the plains and into the settlements there, taking them from the Greeks. The other nations of Europe followed the example of the Greeks. Only the Turks call them Arnauts. They created this name from the word Arianita, the name of the last prince of southern Albania, when they conquered this part of the country after his death in 1470. The Albanians themselves call themselves Skipatars but they do not know where this word comes from. It would probably not in general use at the beginning, just as the word Albanian was not. It would perhaps be no mistake on my part if I suspected that the inhabitants of the Ceraunian mountains got the word initially from the nearby village of Sipjatos, referred to in the year 870. It may also derive from the name of the famous Spata [Shpata] family that owned most of Albania at the end of the 14th century. One thing is certain – that Chalcocondylas refers to them as Spatai. Be this as it may, I do not claim to know anything for certain about the origin of the word in this rather obscure issue. But who are these Skipatars, these Albanians? No one has claimed to know anything reliable or proven about them, or anything beyond the realm of speculation. The similarity of the name caused some observers to see their ancestors in the Caucasus and on the Caspian Sea. Others derived them from Calabria. Some thought they were Slavs and that they stemmed from the Croats, Serbs or Bulgarians. Some even went so far as to claim that they arrived in the region in the 7th century. At the time of Chalcocondylas, many regarded them as the real Illyrians, but he did not agree with them because he preferred to see the Slavs on the Ionian Sea as such. He later believed that they were the remnants of the ancient Macedonians. It would be superfluous to add other views here. They were always a question of speculation. The history of this people and their language were never properly investigated and, as such, no certainty was to be had. I have done what the others have failed to do. I have found no trace of immigration in their history. Their language has, however, left such traces of the fate of this people that I can do no other than see in them the neighbours of the Greeks and the subjects of ancient Rome. These two facts together point to the ancient Illyrians as their origin. They are just as non-Slavic as the Finns, and like the latter, the Albanians have borrowed a few Slavic words into their language, which, however, can only derive from their being neighbours of the Slavs, beginning in the 7th century. Apart from this, they are a people on their own, who, on the one hand have been European for a long time, but who seem to have less connection with the other peoples of Europe than the latter do among themselves. I would make one exception here for the Vlachs who are probably of the same origin as the Albanians, but with time and by mixing substantially with other peoples, evolved differently from the latter. Both their history and their language give proof of this. I regard it as essential to present the main events that have marked the Albanian people in order to cast sufficient light upon their history. This is the best way of solving the problem. Who are the Albanians? How did they arise? How did their language come about? The first people that history recognises in this region are the Illyrians, a large and mighty nation living on the Adriatic Sea, from the Po to the Ambracian Gulf, and northwards to the Danube. Strabo believes that this people spread westwards to Lake Constance, through Noricum and Vindelicia. He also asserts that the Pannonians stemmed from this people. Appian notes clearly that the Pannonians were Illyrians. The Istrians, Japodes, Dalmatae, Liburnians, Dardanians, Ardiaei, Autariates, in short, all the peoples down to the Ceraunian mountains are generally regarded as Illyrians. But they also inhabited wide reaches of Macedonia, Epirus and Thessaly. Only a small portion of Macedonia was inhabited by the Greeks. The mass of the population was Illyrian and Thracian. The Dassaretae, the Lyncestae, the Bryges or Phrygians, the Pelagones, The Eordi, the Elimiotes, the Atintanes, the inhabitants of the region around Candavia, Pella, Edessa and Verva have all been expressly referred to as Illyrian. To a great extent, it was almost only the towns on the coast that had Greek inhabitants. The Macedonians had a language of their own that was also spoken in the regions along the Ionian Sea across from Corfu and, thus in Greek Illyria and Epirus. There were also many non-Greek peoples in Epirus who, as noted above, spoke the Macedonian language, or the Illyrian language, which was probably the same thing. But the Greek colonies here and the dynasty of Aeacides introduced the Greek language such that the various peoples spoke two languages. The Amphilochans further to the south also belonged to this group, and for this reason are also referred to as barbarians by Thucydides. In Thessaly there were also other peoples of foreign origin, such as the Perrhaedans, referred to by Appian as Illyrians, the Athamanes, the Aethices, the Tymphaei and the Penestae, the Helots of the Thessalians, who had probably been the same people as the Illyrian Penestae. Scylax notes that only beyond Ambracia, the Peneus and the town or mountain of Homotion in Magnesia, had the Greeks begun to inhabit the region in a compact manner. In Strabo’s time, the barbarians owned large parts of Greece, and he reports that the Thracians inhabited Macedonia and parts of Thessaly at that time. The Illyrians and Thracians had always been major peoples in Europe. But did they have the same origin or did they stem from different peoples? None of the ancient writers ever asserted that the two peoples had the same origin or that the Illyrians and Thracians were as close to one another as the Illyrians and Dalmatae, or the Thracians and the Getae. But often, the ancient writers regarded smaller peoples attributed to the Thracians as Illyrians, and vice versa. The Dardanians, who are said by Nicholas Damascenus, Strabo, Appian and others to be Illyrians, were regarded by Dio Cassius as being Moesians. And Stephanus says that their towns of Naissus [Nish] and Skupi [Skopje] were Thracian. The Triballi who are almost always called Thracians, are regarded as Illyrians by Aristophanes, Livy and Stephanus. The Istrians and the Daorsi, who were most likely Illyrians, are called Thracians by others. The Tralli for their part, who were Thracians are referred to by other authors as Illyrians. Peoples who once lived in Asia Minor and who belonged to the Phrygian race, such as the Phrygians or Bryges among the Taulanti, the Paeones who called themselves Teucrian colonies, and the Paphlagonian Henetae on the Adriatic are regarded as Illyrians, whereas the Moesians who were regarded as being Teucri, the Thyni, the aforementioned Bryges etc. are counted as Thracians. I have come across settlements in Illyria that have the same names as some in Thrace. The Thracians and the Illyrians are presented as having the same customs. Yet, despite all this, I can find no reason to conclude that the two peoples had a common origin. It is now regarded as likely that the two peoples were related to one another, that they had mixed with one another and where the ancient Greek writers regarded them as two distinct peoples, this is repeated more out of habit than due to any substantial difference in origin. The country now called Albania was inhabited by different peoples who were all part of the Illyrian race. The Encheleans near Rhizano, the Labeates on Lake Zenta, the Phrygians and Parthini around Kruja, the Taulanti around Durrës, not to mention the Bylliones, dhe Amantes, and the Atintanes along the coast. In the interior lived the Almopes, a Paeonian tribe, the Albanians, the Penestae, the Dassaretae who lived on Lake Lychnitis [Ohrid], and the Mela who stretched to the coast, not to mention the Elimiotes and Eordi. Some of these peoples became famous, others remained quite obscure, legendry playing more of a role in their history. Cadmus is said to have reigned over the Encheleans. The Colchians who pursued the Argonauts are said to have settled in Orikum […], Olchinium [Ulqin] and in the region of the Amantes. These Amantes are said to be Euboean Abantes and Locri Epicnemides who ended up here after storms on their way back from Troy, and who forgot their Greek language and customs, and became barbarians. But such information belongs to the fantasies of Greek poets and etymologists. With time, the Greeks also settled here and set up colonies on the coast. Epidamnus or Dyrrhachium [Durrës], and Apollonia, originally Illyrian towns, taken over by colonists from Corinth and Corfu, were the most famous settlements. Oricum, Byllis and Aulon [Vlora] were also settled by the Greeks. But the Illyrians remained the ruling nation. They often attack the Greek colonists and brought them under their sway. The most powerful and famous of all these Illyrian tribes were the Taulanti. Around 650 B.C. they made war under their King Gelaurus on Argeus, the son of the founder of the Macedonian monarchy. In 435 B.C. they came to the assistance of the nobles who had been expelled by the people of Durrës and helped lay siege to the town. About fifty years later, Bardylis, a highway robber, set up a mighty kingdom among the eastern Illyrian tribes, in particular the Dassaretae and Eordi, to which even Macedonia paid tribute. After the terrible defeat and the death of Perdiccas in 360 B.C. the whole kingdom was in jeopardy of becoming an Illyrian province, set up by Philip. He defeated the ninety-year-old Bardylis at a bloody battle and forced him to agree to cede all territory beyond Lake Ohrid. Subsequently, Clitus, Bardylis’ son, became a vassal of Macedonia. He rose in 355 B.C. with the support of Glaucias, king of the Taulanti and of the Autariates. But Alexander defeated him, seized his land and extended Macedonia right to the Taulantian border. This latter people could not be subjected by the Macedonians. 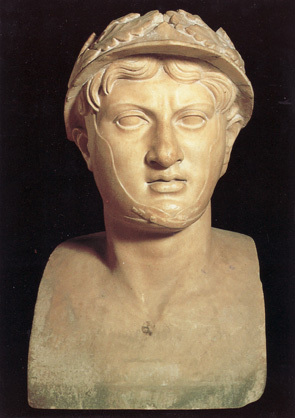 Their king Glaucias sheltered the famed Pyrrhus in 316 B.C., protected him nobly from Cassander and placed him back on his father’s throne. He was defeated by Cassander in 314 and had to render Durrës and Apollonia to him, that the Macedonians had conquered. But Durrës was liberated two years later and Apollonia came under the rule of Glaucias. Cassander endeavoured to reconquer the latter settlement, but failed. In 294, in a treaty with Alexander, son of Cassander, Pyrrhus, received all the territory the Macedonians possessed along the Illyrian coast. Ptolomy Ceraunus made war on the Illyrian King Monius, but I do not know what success he had. The Celts then laid waste to the country. At this time there were certainly many uprisings we do not know of. The Greek settlements on the coast maintained their independence. Apollonia entered into an alliance with the Romans in 266. In 231, Agron, son of Pleuratus, founded a state in southeastern Illyria, that all his neighbours came to fear. All were subjected to his rule, from the Ardiaei to the Atintanes. He humbled the pride of the Aetolians and his ships had free rein on all the seas. He was more powerful than all the other kings before him. But their sway collapsed under Teuta, his wife, who succeeded him. In 228, the Romans, who took vengeance on the Illyrians because of their piracy, forced Teuta to abandon her reign, forced Pinnes, son of Agron, to pay an annual tribute, and took away the regions inhabited by the Atintanes and Parthini, the island of Corfu, that the Illyrians had just conquered, Issa and Pharos, and gave the people of Durrës and Apollonia their freedom. Demetrius, who had supported the Romans, received Pharos, but he soon married Triteuta, the mother of Pinnes, took over the reins of government, persuaded the Atintanes to defect, concluded an alliance with Philip of Macedon and tore the Romans to pieces. In the following war, Demetrius lost everything and was put to flight. The Romans retained not only the above-mentioned countries, but also Pharos and Dimallum, and gave the rest to Pinnes. Scerdilaidas, who ruled over this part of Illyria after him, was initially an ally of the Macedonian king and then of the Romans. In 217, he seized from the Macedonians several towns in the territory of the Pelagones and Dassaretae. But Philip conquered them and all of Scerdilaidas’ possessions on Lake Ohrid back. In 214, Philip also made a surprise attack on Oricum and besieged Apollonia, but the Romans save both towns. In the following year, using a ruse, he took the town of Lissus (Lezha), and several other settlements in Illyria surrendered voluntarily. In 210, Illyria was often subjected to Macedonian rampages since Scerdilaidas and his son Pleuratus had obviously allied themselves with the Romans. A treaty concluded these hostilities in 204. The Atintanes were given to the Macedonian. The Romans received Dimallum, Bargulum, Eugenium, and the territory of the Parthini. War broke out again in 200 and Pleuratus allied himself once more with the Romans. Of the peoples of Illyria, the Dassaretae, Eordi, Elimiotes, Orestae, Penestae, Atintanes, Lyncestae and Parthini were under the sway of Philip at that time. In the treaty of 196, Pleuratus received the latter two peoples. He also ruled over the Dalmatae, but when his son Gentius took the throne, they revolted and could no longer be subjected. The Kingdom of Illyria disintegrated entirely under his rule. He had become an ally of Persius. The Romans made war on him and conquered the whole kingdom in thirty days, forcing him to surrender. This happened in 168 B.C. Illyria’s destiny was sealed the following year. The Taulanti, the Daorsi, the Issani, the Rhizoni, the Olciniati, and the Pirusti under the Dassaretae were declared free. The other Dassaretae, the Scodrani (Labeates), the Selepitani and all other subjected Illyrians were now to give to the Romans half of the taxes they paid to their king, and Illyria was divided into three districts. The regions of the country that had belonged to Perseus, such as the territories of the Eordi, the Lyncestae, the Elimiotes and the Atintanes, remained part of Macedonia even after the conquest. One of the four districts into which the country was divided was inhabited only by Illyrian tribes. These tribes enjoyed some freedom, too. They only had to pay half of normal taxes. Pelagonia was their capital, the place where their assemblies were held, where tribute was sent and where their authorities were elected. They were allowed to keep their frontier lands in order to protect themselves from barbarian invasions. But they were not allowed to maintain contacts with the tribes living in one of the other districts. This part of Macedonia maintained its privileges for a long time and, for this reason, was known as free Macedonia. I have noted that the part of Illyria belonging to Perseus was transferred by the Romans to Macedonia. Also included subsequently were the Greek settlements on the coast and Roman intentions with Gentius and Perseus before the war. All of this was part of free Macedonia and fell, like the rest of the province of Macedonia, initially under the rule of a proconsul, then of a praetor, then of the proconsul again, and finally of a vicarius, who during the reign of Constantine, also held the title of comes. There was a notable change in government in this country under this emperor. The name Illyricum was given to a prefecture encompassing all lands between the Ionian and Aegean seas. The prefect resided for some time in Sirmium [Srem] but was moved to Thessalonica during the unrest caused by Attila and to Justiniana Prima by Justinian I. One of the two diocese of this prefecture received the name Macedonia and within it, as a province of its own, was Macedonian Illyria, which was then called New Epirus and was governed by a praeses. But the northern Illyrians were not so lucky. After the defeat of Gentius by the Romans, they were forced to pay half of annual tribute. They were soon invaded by the Dalmatae in 156 B.C. who devastated their country. The Dalmatae were then defeated and subjected. But since the Romans transformed their country into a province, this part of Gentius’ Illyria, between Durrës and Lezha, was also attached to this province. Caesar himself had been proconsul here for some time. But under Constantine the Great, this northern part of Gentius’ Illyria was again detached from Dalmatia. Since Dalmatia was considered part of the diocese of western Illyricum and in the prefecture of Italy, the other part came under the prefecture of Illyricum and the diocese of Dacia, and was given the new name Praevalis. This little province, that under Justinian I was attached to the ecclesiastical diocese of the new archbishop of Justiniana Prima, was ruled by a praeses. But these Illyrians as subjects of the Romans were still not protected from barbarian invasions. The Ardiaei and the Palarians attacked them around the year 135. Since the latter were defeated by the Romans, the Celtic Scordiscans took over their role and became the scourge of these Illyrians. The Dassaretae and the Hybrians were particularly affected and their territories were almost complete depopulated. With the course of time, the depopulated regions were covered in pathless forests taking several days to cross. In Strabo’s time, the once heavily populated Epirus and Illyria were largely uninhabited. The population that was left over lived in villages and in the ruins of devastated cities. For this reason, many Roman colonies were expedited there and were set up along the coast and in the vacated cities. In Pliny’s time, the towns of Rhizon [Risan], Ascrivium [Kotor], Butua [Budva], Olchinium [Ulqin], Skodra [Shkodra], Lissus [Lezha], Dyrrhachium [Durrës]and Byllis were occupied by Roman colonists. But many of the old Illyrian inhabitants were still around. Strabo refers to the Taulanti, Parthini, Bylliones, Phrygians, Lyncestae, Elimiotes, Eordi and others as tribes who were there at his time. Pliny, for his part, notes that in his day there were barbarians (non-Greeks), the Amantes and Bylliones, in the region of Apollonia. He calls the Dassaretae, Amantes and Orestae free peoples. Ptolemy mentions the Taulanti, Elimiotes, Eordi, Orestae, Dassaretae, Lyncestae and the Albanians, who are referred to for the first time. They most certainly received their name from the town of Albanopolis, which was later called Albanon and Arbanon. They lived in the mountains situated along the border with Macedonia. It is to this location that they owe their survival and felicitous destiny. The Romans introduced their laws and customs everywhere where they came upon uncivilized tribes. The language of the Romans came to dominate wherever their colonies were established, or at least the local language was strongly mixed with Latin elements. Even the richer and more attractive Greek language was subjected to this influence. Once mixed with Latin, it lost its spirit and degenerated into a barbarian tongue. Where less cultured languages were spoken, the influence of Latin was no doubt stronger. Gaul, Spain, Dacia, Thrace and other countries are good examples of this. The language penetrated into the mountains regions of Illyria and mixed with the tongue spoken by the inhabitants, but it did not replace the local language anymore that it did in the Pyrenees and the mountains of Cantabria. In the Albanian lexicon that I have published, there are over 100 words of undeniable Roman origin. During the whole period when the Greeks were neighbours of this people, less than one-third as many Greek words penetrated the language. But, before the rise of the Eastern Empire, the Greeks were never the ruling nation in this region. The Macedonians and the Epirotes, who from time to time had extended their areas of settlement deep into this region, most probably spoke the same language. Although their towns were centres of Greek culture, the Dyrrhachians and Apollonians were too weak to exert any particular influence. Their power was so limited that, even at their zenith, they were under Illyrian dependency. While the migrating tribes were devastating the Roman Empire, New Epirus and Praevalis remained free of such attacks because of the geographical distance and their isolation in the mountains. But as soon as Theodosius divided this huge empire among his sons, these provinces also fell into the hands of the Gothic tribes. They had been attributed to the Eastern Empire. Rufinus, who governed this empire under the weak Arcadius, and strove, by fomenting domestic uprisings, to put himself on the throne, encouraged the famed Alarich to invade Greece with his Visigoths. Alarich was able to subject and scourge these fair lands as he wished because Rufinus had cleared the way for him. Finally, Stilicho came to assist Greece in 396, and Alarich withdrew his army to the two Epiri, where he plundered all of their towns. Soon thereafter, an arrangement was reached with the Byzantine court and he was made praeses of Illyria. He kept Epirus quiet and in 401 and 402 twice attacked Italy, but after an unsuccessful encounter near Pollenza, returned home. In agreement with Stilicho, he remained here until 408. But since Stilicho did not observe the agreement they reached, he attacked Italy once again. This time, Rome was conquered, Italy pillaged, and Alarich’s Goths set up mighty kingdoms in Gaul and Spain. Many Goths had remained in New Epirus. Among their descendants, Malchus refers to Sidimund and Gento, two mighty lords. The former stemmed from the same dynasty as Theodorich the Great and possessed much land near Durrës. He was regarded as a friend of the Romans and enjoyed the favour of Empress Verina. But Gento, who had married a Roman woman, had a number of troops under his command. Since Theodorich the Great invaded Macedonia in order to avenge the treachery of the Romans during his campaign against the Thracian Goths, Sidimund joined him in an alliance and enabled him by a ruse to take over Durrës. The inhabitants fled, as they had from the Goths throughout New Epirus. But Sabinianus, the general of the Illyrian tribes, manage, using a trick, to get Theodorich to proceed to Moesia from where in 488 he finally carried out his campaign against Italy. But it would seem that the Goths also controlled the rest of Illyria and the provinces of Epirus and Praevalis, since Justinian I was making war on them in 535. From that time on, these provinces belonged to the Eastern Empire. In the meanwhile, this part of Illyria, as almost all Roman provinces, was being subjected to attack after attack by other barbarians. The Bulgarians or Hungarians devastated Epirus in 517. It was probably affected once again, ten years later, by the combined attack of the Bulgarians, Gepidae, and Herulans. In 539, the Kurtigur Hungarians devastated everything between the Ionian Sea and the suburbs of Constantinople. The Lombards, whom the Emperor Justinian had settled in Pannonia, also devastated Illyricum right to the borders of Durrës. Then came the Slavs, who in 548 scourged and torched the whole of Illyricum down to the aforementioned town. They were followed by the Avars. However, these provinces were less affected than those on this side of the mountain ranges. The Avar invasion of Dalmatia around the year 630 also had consequences for New Epirus and Praevalis. The Romans in Dalmatia often took refuge in Durrës. In 640, the Croats and Serbs wrested Dalmatia from the Avars, but they kept it for themselves. The Romans only managed to hold on to a few ports. From this time onwards, the Serbs were the immediate neighbours of the Illyrians to the north and northwest. The border between the two peoples on the coast lay between Antivari [Bar] and Budua [Budva], in the region of the Serbian Dioclaeans. With time, the Slavs spread over most of Praevalis, and ruled over all of Zenta and the towns of Scutari [Shkodra], Antivari, Dolcigno [Ulqin], Drivasto [Drisht], Pulati [Pult], and Podgorica. This was part of red Croatia. Shkodra often served as the residence of the kings. Around the year 1360, lower Zenta and, eight years later, upper Zenta were taken from the Serbs by a powerful Albanian lord, Balsa, and since that time it has been considered part of Albania. Most of the inhabitants of this region are still Slavs, but the Albanians also lived there in the Serbian period. The proximity of the Serbs, their rule over Albania on several occasions, and Bulgarian rule have meant that several Slavic words penetrated the Albanian language. The Bulgarians, a people of the same origin as the Hungarians, crossed the Danube in 679 and spread from the Black Sea to Timok. They were to become the worst neighbours and foes of the Byzantines. They were almost constantly on the move through Thrace and Macedonia. After taking Sardica under Krum in 809, they spread into Dardania and came close to the Illyrians on the coast. Since the diocese of Dacia and Praevalis were lost entirely due to their conquests, this province was most probably attached to the diocese of Macedonia. This is not recorded, and Constantine Porphyrogenetos counts the towns of Praevalis as being in New Epirus or in the Theme of Durrës, including the town of Lychnidus [Ohrid] in the interior. The Bulgarians continued expanding, but there is little news of them in the poor history books of the Byzantines. By 838, under Michael (Bogoris), they had reached Thessalonica. Finally, in a treaty in 861, Michael III forced them to evacuate the desolate regions beyond the mountains in Thrace, Macedonia and Illyria. The Bulgarians, who now took to speaking Slavic, called this region Zagora. It stretched from Durrës to Develtos, from Jericho (Oricum) near Thessalonika. Aside from Durrës, that the Byzantines always held on to, the Bulgarians seem to have conquered all of New Epirus. Their kings set up residence in Ohrid. And when the nation adopted the Christian faith, the Bulgarian King Borises set up an archdiocese around 870 whose territory covered one-third of the Bulgarian Empire, from Thessalonica to Jericho (now Rigo), Kanina and Sipjatos. One side of the Ionian Sea was now the border of Bulgaria, and New Epirus was to a great extent a Bulgarian province. The Bulgarians conquered Serbia in 920. Many of those who revolted under Michael, the king’s brother, invaded Greek territory after the death of their leader, pillaged it and settled finally in Nicopolis. At that time, this was the name of a theme that comprised all of Old Epirus. Since these Bulgarians now spoke Slavic and, for the most part, were of Slavic origin, the Abbreviator of Strabo notes that Epirus was also almost completely settled by Slavs. Shortly before this time, the Hungarians are also said to have settled in part of New Epirus. They invaded Thrace under Zuard and Cadusa, conquered Philippopolis and settled between Durrës and the region of the Raitza. They were still said to be there in the 13th century. They were known as the Soba Mogera or silly Hungarians. But the zenith of Bulgarian power was brought to an abrupt end in 968 by the Russians under the warlord Svetoslav. The Russians had been provoked to this end by the Greeks, but they remained in control of the country for a mere three years. It was taken back from them by John Tzimiskes. The subjection of the Bulgarians ended with the death of Tzimiskes in 976. Under their new king Samuel, they became more powerful than ever. He conquered great parts of Thrace, Macedonia, Thessaly, Hellas and the Peloponnese. The internal disorder that struck the Byzantine Empire prevented the brave young Basil from opposing Bulgarian expansion. In New Epirus, Samuel even conquered Durrës, but soon thereafter, the town fell to the Greeks again. Basil had to wage war for thirty years to get back what he had lost. In 1015, he took Ohrid, the capital of the whole Bulgarian Empire, and John Vladislav, King of the Bulgarians, fell during the siege of Durrës in 1017. It was only when Basil had taken over the regions around the Ceraunian mountains, which had resisted longest, that he got his hands on all Bulgarian territories to the Danube (1019). He demanded no more tribute from the subjected peoples than they had been wont to pay to their own kings. In 1036, Serbia again came under Greek sway. However, four years later, not only this country was taken away from them, but also Bulgaria rose in revolt, and the new king Peter Delean conquered Durrës. All of Old Epirus, with the exception of Naupactus, surrendered voluntarily. The reason for the swift conquests by Delean was the heavy tribute demanded by Michael the Paphlagonian. But Bulgaria was defeated once again in 1041. In the following year, Michael, the governor of Durrës attacked Serbia with the 60,000 men he had mustered in his province and in the surrounding region, but was repulsed by Dobroslav, the king of that country. A new Bulgarian uprising under Peter Vodin in 1073 was stifled with the help of the rulers of Ohrid and Diavoli [Devoll]. I would like to note here that what is now called Albania was then called the West. The region was also still called Illyricum. With time, the descendents of the ancient inhabitants of this part of Illyria became known as Albanians or Arbanians. Since the whole of the Byzantine Empire was suffering under the misrule of Michael Ducas, Nicephorus Bryennius, Duke of Durrës, resolved to take the throne of Constantine for himself. Michael himself had already entrusted Nicephorus Bryennius, the bravest man of the empire, with the governing of Durrës that since it suffered greatly from attacks by the Serbs, Croats and Dioclaeans. The natives received him with joy and joined him in his sortie against the Slavs, in which he made much progress. The accusations of his foes, easily believed, and repeated insults convinced him that it was time to dethrone the emperor. In his attempt to do so, he was defeated by Alexius Comnenus who held the rank of nobilissimus at the time, taken prisoner and blinded at the orders of the new Emperor Nicephorus Botaniates. His successor as governor, Nicephorus Basilacius, was not put off by this example. He mustered a new great army of Normans, Bulgarians, Greeks and Albanians, and marched via Ohrid down to Thessalonica. But here, the fate meted out to Bryennius was to be his, too. This happened in 1079. The Normans, who had recently settled in lower Italy, now also began to take an interest in New Epirus. In 1081, Robert Guiscard, Duke of Calabria and Apulia, crossed the sea with a substantial army and navy. The first attack was on Durrës. The Emperor wanted to save the city and marched against Robert with a huge army, including Turks living in Ohrid. He acted rashly in confronting him. Had he waited until the Albanians and the auxiliary troops of the Serb King Vodin had joined him, he would probably have been victorious. Now he was defeated, but he nonetheless took care of Durrës. He gave command of the town to an Albanian called Komiskortes, but the town was forced to surrender to the Normans that winter. With the invasion of Italy by the German King Henry V, Robert was compelled to return to his own territory and gave command for the war against the Greeks to his son Boemund. Everyone submitted to this heroic figure. He conquered Janina, defeated Alexius a second time, took Ohrid and advanced on Serbia, Berrhoia (Veria) and Edessa (Vodena) right to the Axius (Vardar) river. He defeated the emperor again near Larissa, but was soon thereafter forced to return to Aulon [Vlora] in New Epirus because his commanders in the field had risen in revolt. Robert came over once again, but perished during the expedition in 1083. His son Boemund went back to Italy and, by an act of deception, Durrës was returned to the sway of the emperor. All the Norman conquests were thus lost and New Epirus became a Greek province once again. The inhabitants of this region showed Alexius unusual fidelity during this war. In 1107, Boemund returned to New Epirus. First of all, all the territory around Durrës was subjected. Then the town was besieged and terribly attacked. The siege lasted into the following year. Alexius had taken all requisite precautions this time and had occupied much land. The narrow mountain passes near Albanon were occupied by Eustathius Kamykis. Boemund wanted to take them. Several small towns in the region of Albania had surrendered to the Normans. Their inhabitants, who knew all the secret paths through Albania, told Boemund all he wanted to know about them and about the situation in the country right to Devra [Dibra]. The Normans then attacked Kamykis from the front and from the rear, forced him to take flight and took possession of the passes. The campaign was not felicitous. Boemund eventually agreed to make peace, returned to Italy in 1109 and died shortly thereafter. From what was narrated at the time, it seems apparent that the word Albania referred only to a small district in the mountains. Nothing important transpired in New Epirus for a whole century and for this reason, historians had no reason to mention Albania. In 1119, the Greeks conducted a war on Serbia from here. King Roger of Sicily took Corfu in 1149, and devastated the coast of New Epirus. His grandson William the Good seized Durrës from the tyrannical Andronicus in 1185. In 1203 the Venetian fleet forced this town to recognize Alexius Angelus, son of Isaac, as emperor. When the Franks conquered Constantinople in 1204 and the Eastern Empire fell into pieces, Albania and the surrounding regions finally received a ruler of their own. This was Michael Angelus Comnenus, the natural son of the Sevastocrator John, and a sibling of the Emperor Isaac II and Alexius IV. He was sent to Asia Minor by Alexius IV to collect taxes in the province of Mylassenia. But he rose in revolt and waged open war against the emperor with the assistance of the Iconian Sultan Rokneddin Soliman. When Alexius was deposed, he returned to Europe. Here he had no difficulty in taking over Aetolia, Old Epirus and New Epirus, seizing Janina, Arta and Naupactus (Lepanto), in addition to other towns. He was a constant enemy of the Byzantine Franks and was always harassing their territory. As he had no grown-up children of his own, he chose his brother Theodor as co-regent and successor. He was murdered in 1205. His natural son Michael, who was still very young, received only a very small portion of the country. Theodor enlarged his realms substantially to the detriment of the Franks and Bulgarians. He conquered Thessaly, Ohrid, Prilapo [Prilep], Albania and Durrës, having seized the latter from the Venetians. In the mountains of Albania in 1217 he defeated Count Peter of Auxerre, whom the pope had just crowned Emperor of Byzantium and who was invading Theodor’s country, and, by means of a ruse, got hold of his entire army and slew him. The following year, Pope Honorarius III gave him the protection of the Holy See and forbade the Venetians from touching his territories. After some time, Theodor subjected Thessalonica, Thessaly that he took from King Demetrius, and all of Macedonia, with the exception of the lands of the Despot Slav, a Bulgarian who ruled in the region of Melenik [Melnik] and was related to Theodor by marriage. He now assumed the title of emperor and had himself crowned in Thessalonica. He then took Adrianople [Edirne], but in 1230 soon got involved in an unfortunate conflict with the Bulgarian-Vlach King John Asan, who captured him with the help of the Comans and blinded him. The Bulgarians conquered Adrianople, Pelagonia and other towns, pillaged Greater Wallachia, seized Albania and crossed over into Illyria. Asan ruled with a gentle hand. In the meanwhile, Theodor’s brother, Manuel, took over all territory that Asan did not control, and reigned there in peace. But in 1237, Asan married Irene, the daughter of the blinded Theodor, and on this occasion, gave him his freedom and returned his lands. Theodor now had his son, John, crowned as emperor in Thessalonica and sent his brother Manuel into exile to Attalia. He was satisfied with the title of despot. With the help of the Nicaean Emperor John, Manuel returned and took over Greater Wallachia. In addition, several of his old territories seem to have remained faithful to him in his misfortune. He became powerful once again but died soon thereafter, and Michael, his nephew, natural son of the aforementioned Michael, Despot of Epirus, inherited his territories. Michael thus came into possession of all of Epirus, most of Thessaly and parts of Macedonia, and took on the title of despot. But he did not hold onto these countries for long. When John Vatatzes of Nicaea defeated the Emperor John of Thessalonica, forcing the latter to give up the crown, after having taken John’s brother and successor Demetrius prisoner in 1246, and stealing his land, he formed an alliance with Michael, but soon thereafter broke it and marched with his army against Macedonia. As usual, he was successful in this campaign. Kastoria and Diavoli [Devoll] surrendered. The Albanian lord, Gulam, whose wife was related to the Comnenas and whose Albanian forces were near Kastoria, joined his party. Michael was thus forced to appeal for a peace treaty and gave the emperor Prilapus [Prilep] and Velesus [Veles] as well as Kruja in Albania. This took place in 1254. John Vatatzes died the following year. The Bulgarians soon broke the peace treaty and attacked the lands owned by the Nicaean emperor in Greece. Theodor, son of John Vatatzes, hastened thither and got back everything he had lost, with the exception of Tzepaina. A treaty was then concluded with the Bulgarians. This emperor did not possess all the good qualities of his father. When Irene, the spouse of the Despot Michael, visited him (1257) to arrange the marriage of her son to the daughter of the emperor, he had her and her son treacherously arrested. The condition for her release was that he be given Serbia and Durrës. Michael was forced to agree whether he wanted to or not. The marriage then took place and the emperor accorded Nicephorus, his son-in-law and Michael’s son, with the title of despot. When the emperor went back to Asia in 1257, he transferred governance of Albania to Constantine Kavaron, but appointed George Acropolitis as praetor of all the European provinces. Acropolitis travelled that very year to Ohrid and Albania and from there, accompanied by the finest men of the land, continued on to Durrës to put order into the region. From there, he returned via Chounavia and Dibra to Prilep. Here he learned that the Albanian governor Constantine had been taken prison by the Despot Michael by an action undertaken by his brother-in-law, and that all the Albanian tribes had revolted and joined the despot. Acropolitis hastened to Albania with several tribes of his own to endeavour to put down the uprising, but it had gone too far. Acropolitis decided it was best to return from Dibra via Ohrid to Prilep. This town was the only one in the region that he could keep hold of. The other towns and fortresses surrendered to the Despot. Even Prilep finally gave in, and Acropolitis was taken prisoner by treachery. Now Despot Michael was once again ruler of Albania and of all territory from the river Vardar westwards. At this time (1259) the Emperor Theodor died. The reign of his eight-year-old successor was weak and ill-respected. Michael Palaeologus, who was declared regent for the young emperor, took over the empire himself on 1 January 1260 and had the child blinded and imprisoned. The despot used the opportunity to enlarge his territory. He was assisted by his two sons-in-law, King Manfred of Sicily and William Villehardouin, Prince of Achaea. But they were unsuccessful against the Sevastocrator John, brother of Michael Palaeologus, who was sent to combat them. The Prince of Achaea and John, the natural son of the despot, were taken prisoner. The despot then lost all the territories he owned in Macedonia, Thessaly and New Epirus. But the despot became a menace once again when the Sevastocrator returned to Asia. Caesar Alexius Strategopoulos attacked him in 1261 and conquered Constantinople on his way, but he was soon thereafter defeated and taken prisoner by the despot. Peace was restored and Nicephorus, the despot’s son, married his sister, the daughter of the emperor. From this period on, the Albanians were subjects of the emperor. But they soon threw off the yoke and began to live independently. When Durrës was destroyed by an earthquake in 1273, the Albanians and other tribes in the surrounding region pillaged it. The Albanians later reconstructed the town and took it over with the tribes who were allied with them. In all of New Epirus, Despot Michael seems only to have retained possession of Kanina. When the Great Admiral of Sicily, Philip Chinardo, fled Old Epirus with the rest of his people after the defeat of Manfred and joined the despot, the latter, fearing for his power, gave him his wife’s sister in marriage and bestowed upon him Kanina and Corfu. Soon thereafter, Michael had the Great Admiral slain. But Kanina and Corfu submitted to King Charles of Sicily, the possession of which was confirmed by the exiled King Baldwin II in 1267. Charles sent a strong contingent of troops there that were fortified in 1281 by 3000 men. They were commanded by the brave knight, Rousseau de Soli. He was intent on conquering territory and laid siege to the fortress of Beligrad [Berat] on the Polina or Asuni river in New Epirus. But the forces of the Emperor Michael defeated them, forcing them to abandon the siege, and took Soli prisoner. At this time, in 1276, the Despot Michael died. He left Old Epirus and Acarnania to the Despot Nicephorus Angelus, his oldest son, i.e. the lands between the Ceraunian mountains and the Achelous river, including Cephalonia and Ithaca. His natural son, the Sevastocrator John Angelus, received Greater Wallachia or Thessaly, in addition to the land of the Ozolian Locrians. But the story of this prince has little to do with Albanian history. After the death of Charles I of Sicily in 1285, his son and successor Charles II also became lord of Sicilian lands and of New Epirus. But in 1294, he transferred all of these lands and his rights and claims to them - the Principality of Achaia, the Duchy of Athens, the country of Wallachia and the Kingdom of Albania - to Prince Philip of Taranto, his younger son. This prince also received a substantial part of these realms by his marriage in 1288 to Thamar, the daughter of the late Despot Nicephorus. Philip hereafter took on the title of Despot of Romania and of Lord of Durrës and of the Kingdom of Albania. In 1313 he married Catharine of Valois, heiress to the Byzantine Empire, and made himself emperor. But he renounced his claim over Achaia. In 1318, he joined an alliance with King Charles of Hungary, Maladin, Ban of Bosnia, Mentulas Musacchi, Count of Klissania, Andreas Musacchi, Marshall of the Kingdom of Albania, Vladislav Konovic, Count of Dioclea and coastal Albania, and other Serb lords, against Urosh, King of Serbia. He died on 26 December 1332. He was succeeded by his brother John, who had been Prince of Achaia, became Duke of Durrës and Lord of Albania after him, and on John’s his death on 5 April 1335, by his eldest son Charles, who was decapitated in Aversa in 1347 on the orders of King Louis of Hungary. The eldest daughter of Charles married Prince Louis of Navarra, son of King Philip IV in 1366, who took over the duchy. This prince wanted war, and had taken it upon himself to conquer not only Albania, but also Zenta, that the Albanian Lord Balsa had seized. To this end, he sent 600 brave Navarran soldiers to Durrës, who, after his death a short time later in 1373, sold the town to George Balsa, Count of Zenta, for 6000 ducats. I will discuss this Balsa in more detail later on. The princes of Sicily possessed only a small part of New Epirus. The Serbian kings also owned substantial parts of it from time to time, and for this reason Urosh had himself called King of Albania in 1319, and Stephan Dushan, Emperor of Albania, in 1346. The Greek emperors also owned several towns in Albania. Since the empire had been divided in 1322 when the dispute between the two Andronici, grandfather and grandson, was solved, the latter was to be given possession of all the western provinces right to Durrës and Dalmatia. In 1327, another conflict broke out between the two emperors. The younger one hastened to take over Macedonia and, having seized Thessalonica, Edessa (Vodena) and Kastoria, he proceeded to Ohrid and took it, too. Here he was approached by several Albanians, who were nomads living in Kolonea [Kolonja], the two Devolls and in the Ohrid region. They paid tribute to him and promised to serve him willingly. He sent letters to those living at the very edges of the Roman Empire and summoned them to Thessalonica where they then paid homage to him. Soon thereafter, the Serbs began to make their appearance and spread more and more. In 1330, their King Stephen besieged Ohrid and devastated the surrounding regions. But the young Andronicus hasten thither, forced him to lift the siege, conquered some of the fortresses in the neighbourhood that belonged to the Serbs, and took care of the rest of these towns in the western regions. In the same year, Syrgiannis, a mighty general and statesman, and a Coman by birth, who had fallen into disrepute as a result of court intrigues, fled via Euboea, Locris and Acarnania to the Albanians living around Thessaly. They were nomads and independent. From this time onwards, they maintained friendly relations with him, since in 1320, he was still governor in these western reaches. They gave him guides to take him to the Serbian king. Syrgiannis had no difficulty persuading the king to make war on the Greeks. An Albanian and Serbian army followed him to the Vardar, but he was assassinated by treachery there. Peace was then soon restored. In 1332, Stephan Gabrielopoulos died, who, following the death of John Angelus II, son of John Angelus I and grandson of the Despot Michael, had taken control of part of Thessaly. Andronicus the Younger, who was now the sole ruler of the Byzantine Empire, hastened to Thessaly and united the conglomeration of states under Gabrielopoulos with his own lands. While there, twelve thousand Albanians from the mountainous regions of Thessaly arrive, paid tribute to him and promised to serve him. They were from three tribes: the Malakasi, the Bovii and the Mesaritai, who had taken on these names from their tribal heads, although they actually had no leaders as such. They were worried that the Greeks would attack and destroy them during the winter because they had no urban settlements, but lived in the mountains and isolated areas, except in winter. It seems that it was these Albanians who, after the death of John Angelus II, impeded the advance of the Catalonians who had flooded into Thessaly. The Albanians in New Epirus had long broken all oaths and agreements they had reached with the Byzantine Empire, and devastated its provinces. Nicephorus Gregoras called them cunning and evil highway robbers. Cantacuzene called them fickle, restless and adventurous. He noted that they inhabited the regions around Berat and Kanina. In 1337, they had attacked and pillaged several towns. An army sent out to counter them, forced them to desist in their forays, but as soon as the army had departed, they emerged once again from their hiding places and flooded the land, doing much damage to Berat, Kanina, Skeparion [Skrapar] and Klisura [Këlcyra], and taking over the fortress of Timoron [Tomor] near Berat. At this same time, John II Dukas, Despot of Epirus and Aetolia died and left behind him Nicephorus, a twelve-year-old prince. Andronicus decided at that moment to encourage the Albanians to conquer the Despotate. For this campaign he sought the assistance of twelve thousand Turkish infantrymen from Amur, son of Aydin, a Seldjuk emir in Asia Minor. In the spring of 1338, he crossed Thessaly and attacked the Albanians, destroying their country right to Durrës. The Albanians withdrew into their mountains, but the Turks went after them there, too, killing the men and enslaving the women and children. But many of them were bought back by their countrymen who had not insulted the emperor. There was enormous booty in horses, cattle and sheep, because these were the main resources of the Albanians. They were forced to submit and promised obedience. Rumours about the emperor’s success brought about the voluntary submission of the Despotate. The young Nicephorus did rise in revolt the following year and took back the possessions of his father, but Cantacuzene was brave and clever enough to defeat him in 1340 and to make a Byzantine province out of all the Despotate. Nicephorus was forced to put up with the title Panhypersevastos. The emperor had just withdrawn his army from Old Epirus and Acarnania when the Albanians, inhabiting the regions around Pogoniana and Livisda, attacked the towns of these provinces and New Epirus, in particular Berat, and tormented them with daily pillaging and ravages. They continued to do so after the death of the Emperor Andronius in 1341. John Cantacuzene, who had been appointed by the dying king as regent for his son, the young John Palaeologus, would have taken revenge upon them, had he not been impeded from doing so by his rival. In 1342, after taking over the imperial throne, he made his cousin, John Angelus, governor of Greater Walachia or Thessaly. It was foreseen in this appointment that the governor would come to the emperor’s assistance whenever the latter made war on the subjected Greeks and Albanians in the western reaches of the empire. When war was to be waged in the provinces nearer to Constantinople, he was to assist him with all the forces he could put together. I believe one can conclude from this not only that the Albanians were numerous in Thessaly at the time, but that they were much sought after for the army because of their bravery. They were now very powerful in the Despotate. Cantacuzene had even appointed a number of Albanians as governors after taking that region over from Nicephorus. Guini de Spata received the region of Janina, and Musacchi Thopia the region of Arta. Spata soon declared his independence and took over the region governed by Thopia. The rule of John Angelus and later of the Serbs over the Despotate did not impede the progress of the Albanians. Since Simon, or Siniscian [Sinisha], the brother of King Stephen of Serbia, to whom the Despotate had been given after the death of his brother in 1356, was involved in a major war of succession with Urosh, Stephen’s son, the former Despot Nicephorus, son of John II, used the opportunity to retake the territories of his father. He first conquered Thessaly with no difficulty. The Albanians resisted more in the Despotate and would not accept him as their ruler. In order to overcome them more easily, he decided to marry a Serbian princess and repudiate his earlier wife, Cantacuzene’s daughter, whom he had put under arrest in Arta. But with the help of the Albanians and Acarnanians, she managed to flee to the Morea to her brother, the Despot Manuel. From this time on, the Albanians abandoned Nicephorus entirely and threatened to wage open war on him if he did not take back his repudiated wife. Nicephorus actually wanted to reach an agreement with his wife, but because he did not want to appear to have been pressured by the Albanians, he attacked the rebels, with the support of a group of Turks. He attacked his foes at a place called Achelous, but he fell there himself, and with him, his whole army was defeated. This took place in 1357. At this time, since the Serbs under Stephen Dushan had taken over the Despotate and much of Thessaly and Macedonia, they were also able to extend their rule over New Epirus (around 1346). They took Durrës and laid waste to the surrounding region. Emboldened by such victories, Stephen took over the title of Emperor of Romania, Slavonia and Albania. It is said that, having given his daughter Rusna to the Emperor Matthew Cantacuzene in 1355, Dushan wished to bestow Albania on his son-in-law. But some sources have expressed doubt about this. The Serbs probably ruled in this region for as long as Dushan was alive. But the power of the Serbs disintegrated with his death in 1356. Internal fighting for the succession broke out between Urosh and Sinisha, instigated all the more by Helen, the widow of the emperor. Most Serb possession in Greece were lost to the Despot Nicephorus. Durrës came under the rule of Prince Louis of Navarra, who had married the daughter of the late Duke Charles of Durrës. The Albanian Lord Balsa, who was probably of French descent, an adventurous and courageous soul, conquered Shkodra and the lower part of Zenta up to Catarro [Kotor]. When Urosh was defeated by Vukashin in 1368, Balsa took over the upper part of Zenta, with the help of his three brave sons, Stracimir, George and Balsa. In the same year, these three brothers converted from the Greek to the Roman Church, and swore allegiance to the pope in the presence of a bishop. Before he died, Balsa took over the town of Kruja from Charles Thopia. He is also said to have made war on Despot Stephen of Serbia. In view of their harmonious and courageous nature, his three sons increased their lands and power substantially. After the death of Serb King Vukashin in 1371, they attacked his territory, in conjunction with Spata and other Albanian lords, and seized some of it. They besieged the said Bulgarian Emperor Sisman in Durrës who was threatening them and forced him to flee to Bulgaria. They persuaded the Navarren troops in that town to sell it to them. The Albanians among them had become the conquerors. On the one hand, they took over most of interior Macedonia and the towns of Argyropolichna and Kastoria. Then they advanced upon Thessaly. They conquered the region and divided the towns and pastureland among themselves. The latter were most important to them because they were shepherds and had no fixed settlements. When they got to Acarnania, they reached an agreement with Biagio Matarango of Musacchi, who ruled the area, by which they were able to put their animals to pasture there. They soon wanted to rule over the whole region. Their leader, Spata, slew Musacchi while he was out hunting, and took over everything that Musacchi had owned; they made prisoners of the people they found in the fields, and besieged and conquered the town of Arta. Then they attacked the possessions of Count Charles Tocco of Cephalonia, and laid waste and devastated it. This Tocco ruled over this island, as well as over Zante, Santa Maura and some areas of Epirus that had belonged to the Sicilian princes of the house of Anjou. Tocco’s father had received them from the Emperor Robert II, Prince of Taranto. He wanted to take revenge on the Albanians and besieged Arta. But Spata defended the town courageously and in the end, the Albanians, supported by Prialupas, the ruler of Aetolia, a Serbian lord, attacked the army of Tocco and put it to flight. But in the end, Tocco got Acarnania with the assistance of the inhabitants who were weary of the harsh rule of the Albanians and made himself Lord of Aetolia. The Republic of Ragusa negotiated a peace settlement between Tocco and the Albanians in 1376 and Tocco married Catherine, sister of George and Balsa. Tocco’s son Charles II, who received the title of despot from the Emperor Manuel Comnena, conquered Angelokastro and Janina in Albania. He died in 1430. Under the son and grandson of his brother, who ruled after him, his lands were lost bit by bit to the Ottomans. These Turks had already begun to make incursions into Albania under Murad Ghazi, but they made little progress as long as the sons of Balsa were alive. After the death of Nicholas Altoman, Count of Uscitz in 1374, George conquered Trebigno, Kanali and Dracevitza. Tivark, the Ban of Bosnia, however, seized and took them back. Then, with his brother-in-law Charles Thopia and an army of 10,000 men, George attacked and laid waste to the Banat. He died in Shkodra in 1379, shortly after his return from this campaign. He was survived by his younger brother Balsa, who did not have the strong character of his elder brother. The Ottomans were becoming an increasing danger. Forty thousand of them invaded Albania under Vrenes, the most courageous of Murad’s military commanders and defeated the much smaller army of the Albanians on the plain of Beligrad [Berat]. Balsa fell in the battle, as did Ivanish, the son of Vukashin. This took place in 1383. George Stracimir Balsa, son of Stracimir, then came to power, got involved in a new war with the Ottomans in 1386 and was unlucky, losing Kastoria, Berat, Kruja and Durrës, although he got the latter city back and pledged it to the Venetians. His son and successor, Balza, took the town back from the Venetians, lost several sites to them in war, and presented Chernagora [Montenegro] to Stephen of Maramont and in 1421, died on a journey to visit his uncle, the Despot Stephen, in Serbia. The Venetians took advantage of his death and conquered Zenta. But the Serb Despot took everything from them except Shkodra, Dulcigno [Ulqin] and Budua [Budva] and gave it all to the son of his brother, George Vukovich in 1425, who later became Despot of Serbia. Under his rule, the Venetians retained only Shkodra and Durrës. His territories became an Ottoman province under his son, Lazar, in 1458. As the power of the Balsa gradually declined, two other Albanian dynasties began to rise in Albania: the Arianita, who were also called Comnena, and the Castriota. The Thopia and the Spani also rose in power, but were not as prominent as the former, who, under the two famous heroes, George Castriota or Iskender-Beg [Scanderbeg], and his father-in-law Arianita Thopia Golem, even put fear into the hearts of the Ottomans under Mohammed II. At that time, the river Vavissa (Aous) [Vjosa] between Pollonia [Apollonia] and Valona [Vlora] constituted the border between the territories of these dynasties, such that everything north up to Zenta, with the exception of the towns under Venetian control, belonged to the Castriota, and the lands to the south, down to the Gulf of Arta belonged to the Arianita. I do not wish to dwell on Albanian history in this period because it is known well enough from the life of Iskender-Beg. The Albanians played a magnificent role at the time. Fighting for fatherland and freedom and inspired by the heroism of their leaders, they turned into heroes themselves. They became a support for fallen, exiled princes, the much sought allies of mighty kings, and a bulwark against the unimpeded advancing arms of the Ottomans. The whole glorious reign of Iskender-Beg, whom his people called king and who was recognized as such by other powers (1443-1467), was characterized by more and more Albanian victories. But their good luck was not to last forever. As soon as they lost their great leaders, Iskender-beg in 1467 and Arianita in 1469, they were forced to submit for the greater part to the supremacy of Mohammed II. and their princes were forced to take refuge in Italy. But they never lost the fame of bravery and excellence that they have since enjoyed. Even the Ottomans recognized this and accorded to the Albanians more respect than to other subjected peoples. For this reason, the Albanians have very often risen to high rank with the Porte. Yet, many members of this hearty nation, in particular the Chimariots, inhabitants of the Ceraunian mountains, have retained their freedom up to the present day, and the campaigns led personally by Bayezid II (1492) and Suleyman the Magnificent (1537) against them with huge armies, proved futile. I would like to add something about the Albanians in the Morea. We do not know when they first arrived in this region. It is said that Matthew Cantacuzene who had received Albania from his Serbian wife, expelled to this country all the nobles of his land, whom he found suspicious. In 1391, there were already numerous Albanians on the peninsula. Demetrius Raul, a commander of the Despot Theodor of Morea, assembled an army of Albanians and Leontarians and, with them, attacked Prince Asan Centerion of Achaia who had invaded the Morea with a Turkish commander called Vrenes, and conquered Akuva. But Vrenes soon brought about a disastrous defeat for the Albanians. In 1423, Murad II sent Turachan [Turhan] to the Morea to lay waste to Venetian strongholds there, and the Albanians in Tavia, a region in the middle of the country, thus had a new leader of their own and decided to break away from the Greek princes. They also attacked Turhan but were repulsed. When Constantine Dragases, the son of the Emperor Manuel arrived in the Morea as despot in 1443 and took control of the Isthmus (Hexamilion), he also took over the Albanians living in Pindus, who were called Arabaeans. His ever increasing power caused Sultan Murad to attack him and the Despot of Achaia, with an army of 60,000 men. They endeavoured to resist, but abandoned and betrayed by their Albanians, they soon fell into the hands of the Turks. Mohammed II, the son of Murad, finally conquered Constantinople in 1453. All of Greece was horrified. The princes of the Morea, Thomas and Demetrius Palaeologus, fled to the banks of the sea in order to get to Italy. The Albanians refused to be their subjects any longer and resolved to rule in the Morea themselves. They chose Manuel Cantacuzene as their leader, a grandson of Matthew, and seem to have declared war on the Palaeologi. At the time, they were all shepherds and had no fix homes. The wars they waged were simply ones of pillaging, but they also conquered towns. They were supported by some mighty Peleponnesian rulers, such as Martin Asan Centerion, brother-in-law of the Despot Thomas, Nicephorus Lucanis, and Bochalis, Lord of Leontari. The Morea was lost when the despots received support from Turkish troops under Turhan in 1454. The Albanians were now out of luck. They sent their representatives to the princes and informed them that they would be willing to submit to their rule once again, if they could keep all the territory they had conquered and all the herds they had captured. A treaty was contracted under these conditions. But peace was not restored. Instigated by Lucanis, the Albanians and the other inhabitants of the Morea refused to offer obedience to the princes and demanded an equal portion of territory, nor were they willing to pay the Turks the annual tribute of twelve thousand ducats. Mohammed the Conqueror demanded payment of tribute for three years in vain. In 1453, he finally invaded the Peleponnese with a huge army. Resistance failed, but he paid dearly for the gains he made. The Albanians opposed him at every step of the way. This time, Mohammed made peace with the despots, retained some of his conquests and recalled Omar, son of Turhan, and his army. In the following year, there was war between the two despots Thomas and Demetrius. Thomas parted ways with Mohammed. The Albanians adhered to this despot, but their rashness often caused them to change from one side to the other, depending on who offered them the better deal. In addition to this, their excesses were unparalleled. Mohammed finally put an end to this internal chaos in 1460. He took the land away from both the despots and turned the Morea into an Ottoman province. He treated the Albanians worst of all, slaughtering even those of them who surrendered to him. It cost him much to overcome their resistance, but Mohammed eventually got them under his sway. The Albanians have lived on the peninsula ever since that time and have settlements there up to the present day. This is all I have to report on the Albanians for the moment. The material is incomplete. Indeed, it is but a fragment, and not well connected. However, this was not my fault, but stems rather from the lack of information, that has prevented anyone up to now from writing their history in its entirety. I concentrated on the oldest periods because these were the least known ones. I only touched upon the better known periods and broke off at the moment when their history began to become more interesting. It was not my aim to write a full-length history. I was only striving to bring to light the origins of the Albanians, as evinced by a number of chronologically ordered facts, to do away with the darkness, confusion and audacious speculation that had been prevalent, and to make this nation known in the whole course of its history, a nation that is among the oldest inhabitants of Europe and that, despite the influx of the Greeks, Romans, Goths, Slavs, French, Italians and Turks, has managed to survive.